What with the paltry network offerings of the figure skating Grand Prix series and my schedule this past weekend, I have only seen parts of the men’s competition in Ontario, California—fair disclosure. Michael Brezina delivered a phenomenal short program, putting himself safely ahead of the entire field going into the free skate. 29-year-old Belgian veteran, Kevin van der Perren (who you may recall as Skeletor skating to “Night On Bald Mountain” during the Vancouver Olympics) completed his short program in fourth place. On Saturday afternoon, he roared into first place with his free skate to the score of Man in the Iron Mask (which I personally feel strongly about as an under-appreciated body of cinematic music), fueled with a huge quad toeloop. The program was great fun to watch, and I have to say I am glad that contrary to beliefs during the 2010 Worlds, van der Perren has continued to compete. He says this year is all about European Championships for him. I am also glad that the “Night on Bald Mountain” era is behind us, because I am still traumatized by that final vignette of Fantasia viewed as a child. Following van der Perren’s long program, three more skaters took to the ice including Daisuke Murakami, Takahiko Kozuka and finally Michal Brezina. Murakami suffered a disappointing long program. Kozuka came in just behind van der Perren (combined 212.48 to 212.09). As Brezina entered the ice, the big question commentators pondered was whether he would really go after the gold, or just play it safe. Brezina delivered an overall underachieving performance, dropping points here and there, choosing not to attempt a quad, falling on a triple loop, and singling a lutz. Aside from those errors, the skate felt a little lackluster, and commentators seemed almost ready to crown van der Perren king for the day. Somewhat surprisingly, Brezina (who appeared frustrated and disappointed in the kiss and cry area) still managed to finish four points ahead of the field with an even 216 combined score (although van der Perren did win the free skate event of Skate America). This announcement was followed by the most boring and rather bizarre of reactions. Rather than displaying signs of relief at the win, Brezina sort of shrugged with a bemused and rather unamused expression. He later complained about his coaches, saying that he had wanted to go out on the ice and try for two quads, but they had persuaded him to play it safe. Presumably, his expression is the result of the fact that even though he won, it was not the win he wanted. Alas. Sidenote: I still hate half and half costumes. I recently came upon this gem of a photo on John Chuckman’s Chicago Nostalgia & Memorabilia Blog. I always wanted to go the Ice Capades. This lovely lady was photographed on the 1963 tour at Chicago Stadium. Sometimes I wish that Stars on Ice was the Ice Capades. Ice Capades just sounds so fun! The tour was founded in 1940, and after several years of rough times finally closed in 1995. But she doesn’t know about that. From some research I’ve done, this may be a photo of Catherine (Cathy) Machado, the first Hispanic athlete to compete for the U.S. Olympic team in 1956. She was on tour in 1963, and the face looks similar to some photos I found of Machado. The costume does not match up to video from 1963 Ice Capades available of YouTube… but we all know that figure skating requires a lot of costumes changes. Care for some vintage footage? Sure. Anyways, in addition to that boss vintage photo, Chuckman’s blog has lots of neat historical photographs of Chicago, definitely worth checking out. Just for fun, as the Four Continents Championship was not aired in the U.S., enjoy some exhibition skates and a medal ceremony. Ladies medal ceremony. I wonder how much practice goes into those pre-podium fancy bows? Going in podium order, first up: Miki Ando’s celebratory performance, skating as her usual graceful self in yet another white, long-sleeved, high-necked costume. It happens. 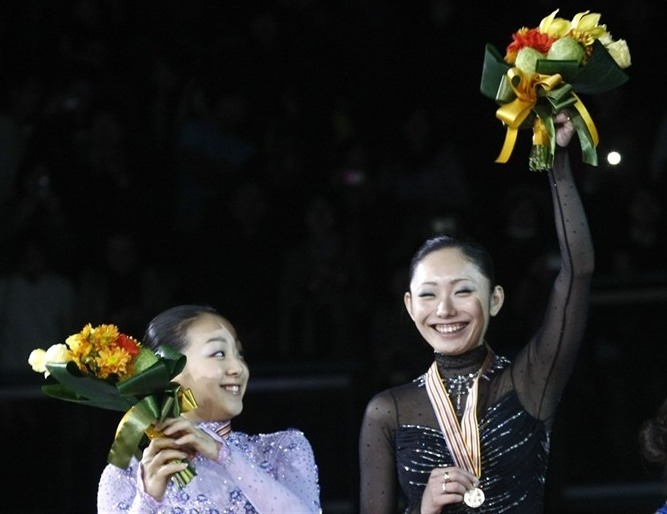 Mao Asada’s exhibition performance. I love Asada because when she’s in the zone, she can have this expression like she will just go ahead and end your life if you cross her. Not necessarily in this tulle-skirted exhibition, but after all, there’s no need to strike fear into hearts during the exhibition. Cannot wait to see her defend at Worlds. Also, dear lady throwing triple axels left and right. Fierce. Daisuke Takahashi soaking up the love from the crowd. Possibly because he won the Words to Bumble Craziest Figure Skating Hair Award; probably because he’s been a top Japanese competitor for a long time. FYI: there’s a pretty jazzy encore, so if the “Amélie” program is not your thing for some reason, stay tuned because the double feature starts around 4:20. Yuzuru Hanyu skating to U2. I could make a really bad joke about dizzying nature of figure skating and “Vertigo,” but I’ll just mention the opportunity. 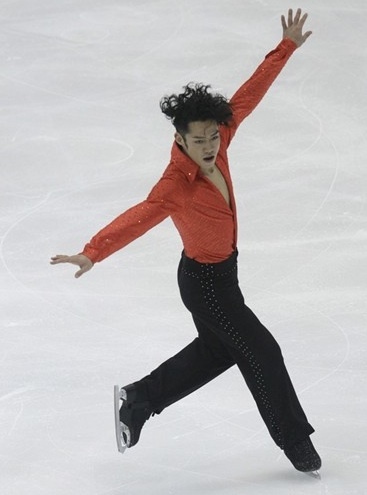 Here it feels like he is just skating through the music, but nonetheless, he is Japan’s rising men’s star. Please someone make the pleather go away. Not OK.
Jeremy Abbott’s adorable exhibition skate to Plain White Ts. He has a prop! Exhibitions are so fun. Yes? 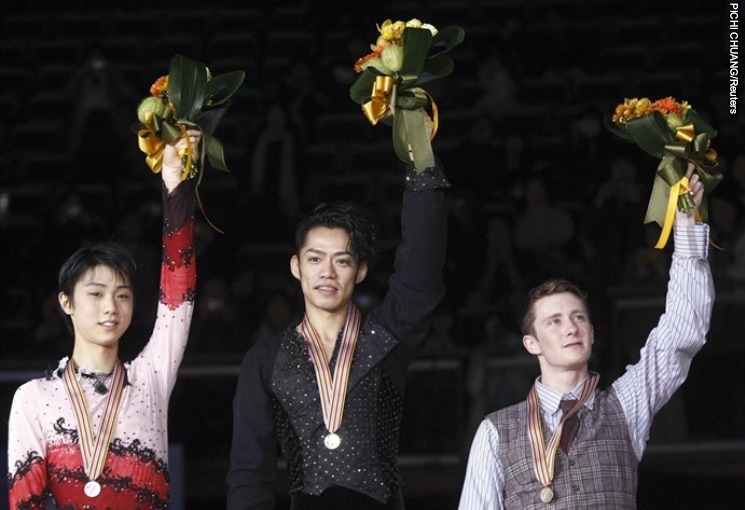 Also, he took the gold at this past week’s Four Continents men’s competition. But in this moment, it’s all about his crazy-awesome hair. Take a look and love it. The Four Continents figure skating competition serves as a counterpart to the European Championships, bringing together athletes from the Americas, Asia, Africa and Oceania in a warm-up for the upcoming World Championships in March. Mirai Nagasu and Jeremy Abbott of the U.S. both suffered disappointment at Nationals this past January, where neither delivered a strong enough free skate (after Nagasu led and Abbott stood in second coming out of the short program competitions) to represent the U.S. at Worlds in Tokyo next month. Nagasu was swept back by Alissa Czisny, despite a solid long program that still garnered her a bronze finish; Abbott suffered a couple falls and could not stand up to the positive energy behind Ryan Bradley, coming in just off the podium in 4th place. Of course, bronze and one step off the podium—in the great scheme of things—are not to be sneezed at, but Abbott was the defending champion (and fourth place is always rough city in medal sports) and Nagasu has serious demons to battle whenever she leads in the short. So basically, this Four Continents competition took the place of Worlds for Nagasu and Abbott this season. They made the most of it. After a strong short program that landed her in fourth position, Nagasu finally hit the perfect Memoirs of a Geisha free skate that has eluded her all season, winning her the bronze behind Miki Ando and Mao Asada (World Champion) of Japan, leading the American women at Four Continents. The aerial view of a spin element around 1:45 is a neat vantage point not generally shown. The whole program was delightful and the expression on Nagasu’s face at the end because she knows it, is priceless. 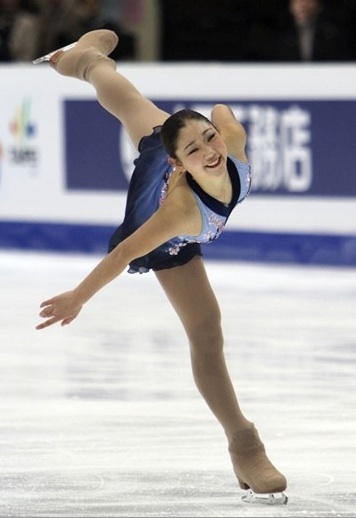 Also the announcer accidentally proclaimed that she was representing Japan before a hasty correction was made. Hello awkward. Abbott came out of the men’s short program in second position and delivered his season’s best in the free skate (148.98, 225.71 total), likewise landing himself on the podium with a bronze medal, the leading American man. I love that Life is Beautiful free skate. Love it. Like Nagasu, Abbott prevented a Japanese podium sweep, standing behind Daisuke Takahashi and newcomer Yuzuru Hanyu. So, dear Mirai Nagasu and Jeremy Abbott: Way to strike back. Words to Bumble ❤ you.